Outside In: What are Americans Reading About NAFTA? Trade policy experts are busy pulling together public comments and suggestions for negotiations that will take place this Fall. 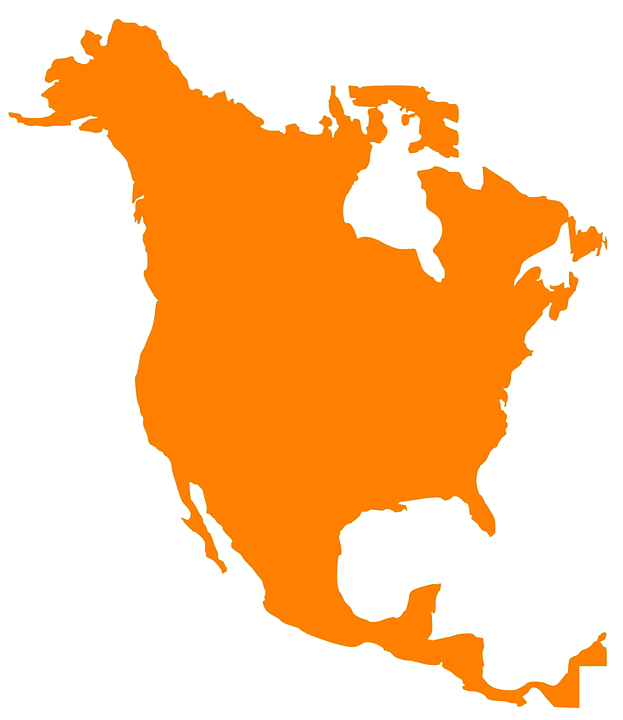 But, what do Americans, particularly outside of the Beltway, think about this? Are they even seeing any news about trade with our neighbors? We tested our theory that due to the speed at which information and news travels, coupled with the current political climate, NAFTA and trade are, effectively, on the back burner and folks across the country aren’t reading any new news. The first big takeaway: in the press, no one is talking about NAFTA. On the day after the Federal Register notice there were only a handful of stories that focused on trade, and over the following week not one front page story in 18 prominent publications from coast-to-coast even mentioned NAFTA. 0.29% of front page (print and online) stories referenced trade or NAFTA (that is just 5 across 1,707 stories reviewed). The only stories written were on the day after the official notice posted (May 18th) – no follow up stories occurred. Of the five stories that mentioned NAFTA, 2 were from national outlets, 2 were from purple state outlets, 1 was from red state outlets and none were from blue state outlets (methodology below). The second big takeaway: this was also the story across Twitter – there was no significant interest or engagement around the official notice. Ironically, in the previous month, initial activity spiked exponentially higher as the discussion of modernizing NAFTA became part of the online conversation. And, it has been remarkably silent since (Exhibit 1). Peak Twitter engagement occurred on April 27th, when the Administration began talking about NAFTA modernization with approximately 1 million mentions. When the official notice posted, on May 18th, there were only 124,200 twitter mentions – 87.6% lower than the spike the month earlier. So, what does this all mean? There is a vacuum that will soon be filled but the real question is, who will do so first? It sounds like trade will not only impact this Congress but be a big part of the 2018 election. Like previous posts, we reviewed the number of stories included on the front page of each print publication that mentioned two topics: trade and NAFTA. In addition, at 2pm EST that same day, we reviewed how many stories in the most viewed section included those topics. This accounted for both print and online readership. This was conducted the day the new Federal Register notification was announced, Friday, May, 19th 2017, through Friday, May 26th, 2017, as a snapshot of the news coverage. 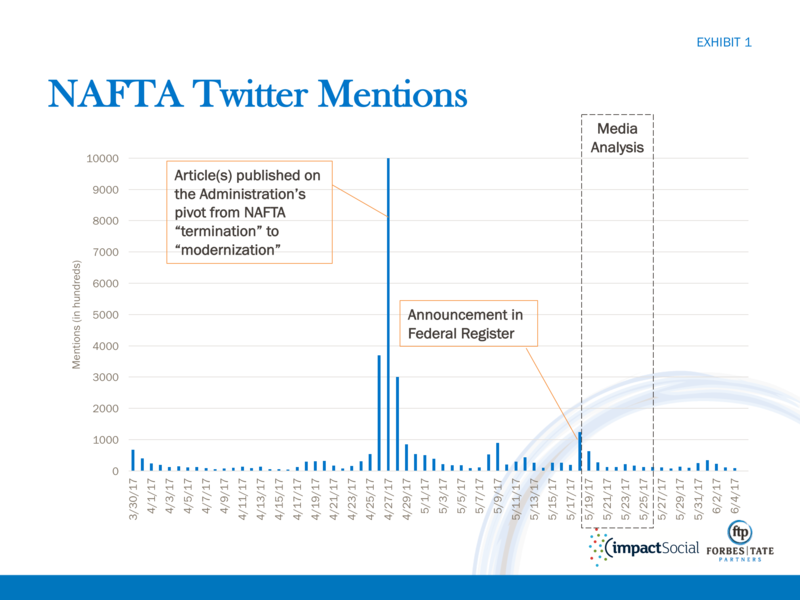 FTP worked with ImpactSocial to quantify the conversation (volume of tweets), on Twitter, related to NAFTA from March 30th to June 6th.